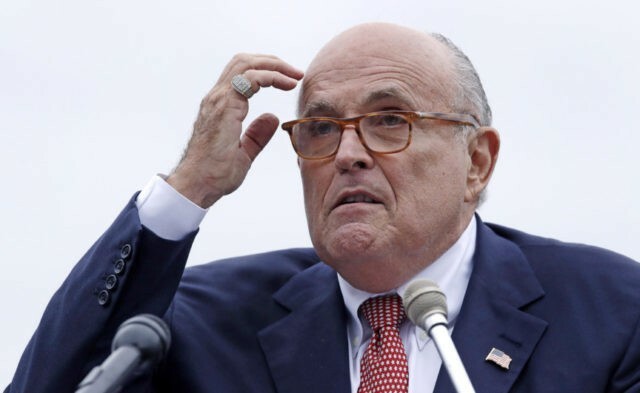 WASHINGTON (AP) — President Donald Trump’s lawyer Rudy Giuliani on Thursday walked back comments from the night before in which he maintained that he had “never said there was no collusion” between Russia and members of Trump’s 2016 White House campaign. Giuliani issued a statement aimed at clarifying a Wednesday night CNN interview that appeared to leave open the possibility of improper contacts during the campaign, in light of court filings in the past year that have detailed ties between Trump aides and Russia. That was an apparent reversal from the television appearance in which he said, “I never said there was no collusion between the campaign or between people in the campaign.” He had previously denied any collusion. It was not clear whether Giuliani in the television interview was reflecting a new position or talking point from the Trump legal team or was making a strategic attempt to get ahead of potentially damaging findings from special counsel Robert Mueller, who has been investigating potential coordination between Russia and the president’s campaign. Either way, the comment reflected a stark turnabout from long-standing denials by the White House and Trump advisers of improper collusion, and it underscored how the president’s lawyers have adapted their message and defenses as additional revelations have emerged. In November 2016, for instance, Trump spokeswoman Hope Hicks said, “There was no communication between the campaign and any foreign entity during the campaign.” Trump himself has repeatedly insisted there was no collusion during his successful White House run. On Wednesday, Giuliani told CNN that even if some people working on the campaign did something wrong, the president was not part of any collusion. “There is not a single bit of evidence the president of the United States committed the only crime you could commit here, conspired with the Russians to hack the DNC,” Giuliani said, referring to the Democratic National Committee. The comments on collusion came after Giuliani was confronted with prosecutors’ allegations, detailed in court papers earlier this month, that former Trump campaign chairman Paul Manafort had lied to investigators about sharing campaign polling data with an associate whom U.S. authorities have tied to Russian intelligence. Giuliani repeated to the AP on Thursday that there was no collusion “connected to Russian hacking” and that Manafort’s sharing of polling data had nothing to do with the campaign or the president. So far, Mueller has charged 33 people, including five Trump associates and 32 Russians accused of interfering in the election either through hacking or through a hidden social media campaign aimed at swaying American public opinion. Giuliani also said the Trump legal team had told Mueller that the president would not answer any additional questions from prosecutors. Trump has so far answered only a limited number of questions in writing. Trump’s lawyers have balked at the idea of a face-to-face interview with Mueller’s office or having Trump questioned about potential obstruction of justice or other actions he took as president. Giuliani reiterated his desire to have an early look at whatever report Mueller produces at the conclusion of his investigation.